Manchester City striker Mario Balotelli will face his club at a Premier League tribunal on Wednesday after appealing their decision to fine him two weeks' wages for his poor disciplinary record in the 2011-12 season. City initially took the action in April after the Italy international was dismissed in the 1-0 defeat against Arsenal at the Emirates Stadium. 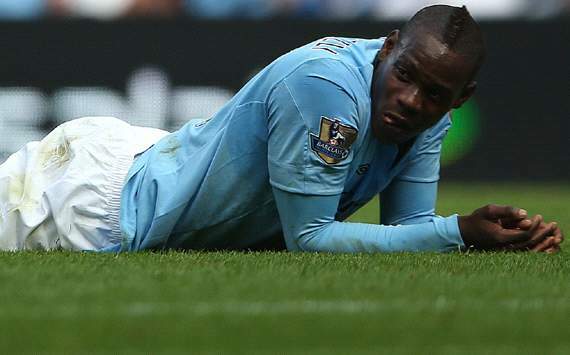 Balotelli chose to appeal the punishment but the penalty was upheld by a panel made up of City board members. A fine of two weeks' wages is the maximum a club is able to hand out. Now, the 22-year-old will face a Premier League panel. Reports indicate he will be joined by his Italian lawyer and a representative from the Professional Footballers' Association, while City will be represented by their legal team. "We try to avoid situations like this wherever possible, but the player and club have not been able to resolve this situation," PFA chief executive Gordon Taylor told the BBC. Balotelli was sent off three times last season - once retrospectively - and received an additional nine yellow cards, missing a total of 11 matches due to suspension. After being substituted in the 3-2 defeat against Manchester United, Balotelli was left out of Roberto Mancini's matchday squad for the game against Newcastle United on Saturday. Mancini admitted that he had omitted the forward purely due to his poor form and urged him to improve his training levels in order to return to the starting XI. "At this moment, Mario is not in good form and for this reason he is at home," the manager said. "It is only for this reason. To get back into the team he needs to work in training and when he plays, he needs to play well."